When WONGDOODY was acquired by Infosys, I knew we would be moving onto a more international stage. What I didn’t realize was the first month of 2019 would take me from my home base in Los Angeles to Bangalore to Davos. I’ve spent my entire career in advertising and attended lots of interesting and engaging conferences. Davos wasn’t on my conference bucket list because it was literally and figuratively a world away from my job as President of an independent ad agency with offices in New York and Seattle. But now that we’re part of Infosys, I was invited to attend, and I was thrilled. After reading through the prep material, which outlined the extensive security measures, the variety of badges and passes and all other mechanisms to protect the invitees, which included many heads of state, I arrived in Davos. 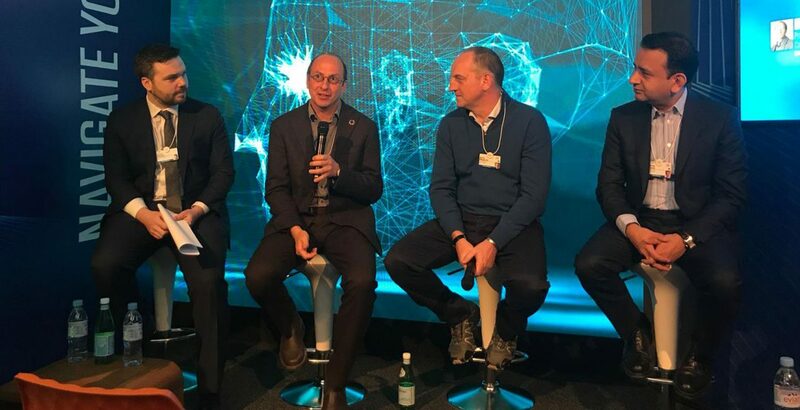 The theme of Davos this year is Globalization 4.0 and I was drawn to the impact of what the WEF materials called the “whole new wave of change …crashing on us in the form of the high-tech digital revolution” on the workforce. As a first-time attendee, American woman and leader of an advertising agency here’s what really stood out for me in Davos. It’s cold. Ok, I’m from LA, but it is cold. The paths are covered with ice. But it creates a sense of camaraderie and equality; everyone is sliding and falling. A man in a suit and tie took my elbow after I slipped and called out “well done!” when I managed not to fall. Does it help us all to be reminded so clearly that we don’t have control over something as basic as the weather? Is Mother Nature the Davos delegate we cannot ignore? The overall composition of the invitees are only 22% female. Up from 21% last year. And yet I’m struck by how many women leaders there are from business and politics. I see plenty of women in meetings and at events. One of the best parts of my trip was a visit to The Female Quotient Equality Lounge. Beyond being a cozy space with empowering messages all around, the panels ran every 30 minutes all day and the three I saw were amazing. One was with the CMO of Unilever and he discussed the stereotypical portrayal of women in advertising. Another speaker did a presentation on presence and body language and the differences between men and women. The place was packed — every seat filled with tons of people standing. But that is also because most of us women are not in the forum where the real action is. One speaker said it well “the business of business is to change the world.” I was struck by the consistent themes of how business can improve the world. If we can harness the economic muscle represented here, we could actually drive positive change for the planet and the people on it. These world leaders have stamina. Sessions start at 6am and evening events go until 1am. Coffee consumption is high. My American accent is certainly in the minority. I heard mostly British and Western European accents, but I was surprised by how few people of color I saw, considering the international nature of the event. Human capital is a major theme. How can businesses impact the potential divide between the rich who have access to education that the poor do not? We need to educate people in both our schools and corporations to maximize the shift to digital, but our educational systems are way behind. It’s interesting to see so many leaders and ministers at Davos when only one of them is a Minister of Education. “Re-skilling” is mentioned over and over again: making sure that workers have the most up to date skills. Not only does this come up in conversations about human capital, but also as a way to increase diversity and inclusion which is another major theme. The design challenge is to empower people to use AI to give them the chance to offload mindless tasks and focus on the important things. Which is a really different way of working for many, but it can start with leaders assuming their workforce is capable and interested in doing more thoughtful, strategic work and learning new technologies. I am incredibly inspired by the attention to humanity; that businesses feel a true responsibility to re-skill their talent, to be more inclusive in their hiring and training and retention policies and to look at the way the work they are doing can make a positive societal impact.